When you think of baklava, does Turkey come to mind? Did you know that some of the world's finest baklava comes not from Greece or the Middle East, but from Turkey? Most baklava fans are familiar with Greek-style baklava which often features honey as the main sweetening ingredient. Turkish baklava is sweetened with "şerbet" (share-BET'), a light syrup made from sugar, water, and lemon juice. This makes Turkish baklava much lighter and crispier than most Greek or Middle Eastern-style varieties. In every Turkish pastry shop, supermarket and household, you'll find endless varieties of baklava made with walnuts, hazelnuts, pistachios and more, all in shapes and sizes you'd never dream of. Squares, diamonds, rolls and spirals. It's a baklava-lovers paradise. 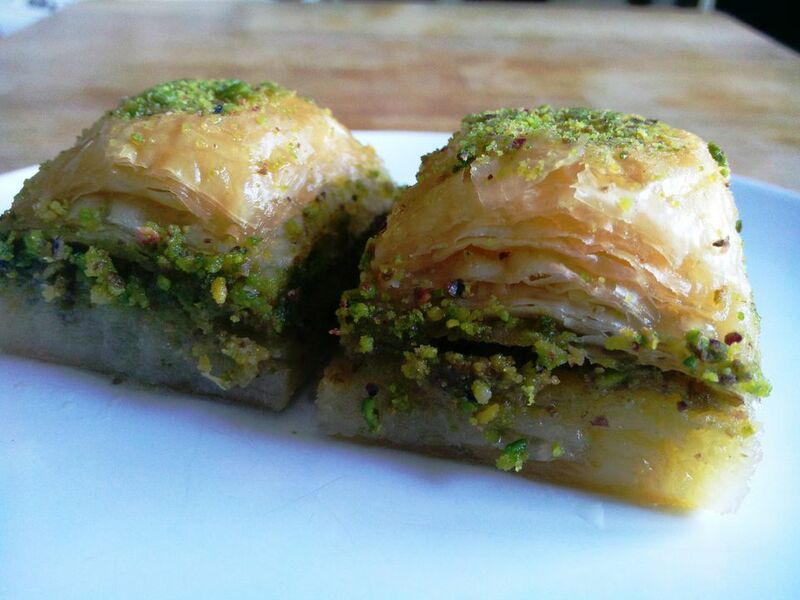 The most coveted baklava of them all is pistachio baklava made with bright green, raw pistachio nuts. The recipe for this simple, square-cut baklava is below. If you wish, you can substitute the pistachios with ground walnuts or hazelnuts for a more economical version of this recipe. Go ahead and experiment with different nuts to give you different flavors. Does it seem intimidating? Don't worry. You don't have to go all the way to Turkey to enjoy good baklava. And you won't have to roll out paper-thin sheets of "yufka" (yoof-KAH'), or pastry yourself. Baklava is actually very easy to make at home with ready-made, pre-packaged "baklava yufkası" (bahk-lah-VAH' yoof-kah-SU'), better known as phyllo pastry. You can find phyllo dough in the frozen food section of your grocery store, or in Middle Eastern and Greek grocers. Begin by making the syrup which you'll pour over the hot baklava later on. Combine the water, sugar and lemon juice in a small saucepan, bring the mixture to a boil and let it simmer slowly uncovered while you prepare the rest of the baklava. The next important step is preparing your clarified butter. Mix the ground pistachio nuts with 2 tablespoons of sugar. Brush the bottom of your baking pan with butter and sprinkle a few pinches of the ground pistachio nuts over the butter. If it's your first time using fresh or frozen phyllo dough, review these tips for using ready phyllo dough. Once you feel confident, take your first layer of phyllo and set it in place. Working quickly, brush the entire piece of phyllo with the butter. Repeat in the same manner with 18 leaves of phyllo. Once you've buttered the 18th layer, use all of the ground pistachio mixtures to make an even layer going all the way to the edges of the pan. Place another layer of phyllo over the nuts and butter it. Repeat until you finish the last layer. If you have extra butter left, set it aside. Using a sharp knife or a pastry cutter, gently cut the baklava into even squares or diamond shapes. If you're using a round pan, you can cut it into large, narrow slivers, if you wish. Drizzle the leftover butter over the top. Place the pan in a preheated 395° F/200° C oven and set the timer for 45 minutes. When ready, remove the tray from the oven. While it's still piping hot, immediately pour the cold syrup evenly over the baklava. Let it bubble up then settle. Generously sprinkle more ground pistachios over the top. Leave your baklava to cool down to room temperature before serving.